Docudrama written and directed by Federico Fellini. 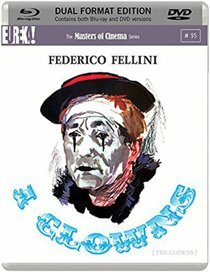 The film aims to satisfy Fellini’s childhood obsession with clowns, featuring footage of the circus and its performers arriving into town, setting up and beginning their transformation from man into clown. The clowns featured in the film include Riccardo Billi as Billi, Gigi Reder as Reder and Tino Scotti as Scotti.